On the Day of Pentecost, the apostle Peter quoted the prophet Joel, saying, “Your sons and daughters will prophesy” (Acts 2:17, cf. Joel 2:28). God's promise of an eschatological outpouring of the Holy Spirit has been fulfilled in Jesus Christ. The Holy Spirit calls and empowers both men and women to exercise prophetic ministry in the last days. Historically, the Assemblies of God has recognized that this Spirit-empowerment opens the doors of credentialed ministry to all qualified applicants, whether men or women. The rise of the so-called New Calvinism, which often teaches that credentialed ministry is open to men only, is causing many young men (and a few young women) to step back from our historic commitment to equality in ministry. 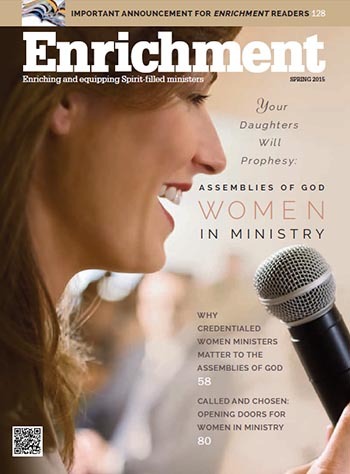 In light of this reality, the spring 2015 issue of Enrichment will examine the issue of Assemblies of God women in ministry under the theme, “Your daughters will prophesy.” The purpose of this issue is to promote the value of credentialed women ministers within the Assemblies of God (USA) by exploring our history, searching the Scriptures, and evaluating our contemporary practice through the lens of our Pentecostal commitments.